Luminary Walk is over, and it was a success despite the rather “iffy” weather. So many people who came on the foggy night commented on how quiet and beautiful it was. For the three weekends we had approximately 22,705 visitors and the event will produce about $160,000 in profits, which will be returned to the Arboretum in various ways over the next months. This was the first year we sold tickets on a per-night basis in an effort to overcome the overcrowding we had last year. We sold out one night and didn’t notice any particular problems associated with our decision to sell tickets this way. We also improved traffic flow by adding some additional places to park and opening a second entrance. The good news is that the previous year’s traffic backup on 179th Street was avoided. Since last month, we elected two additional members to the Friends of the Arboretum Advisory Board. We welcome Brian Hancock and Mike Hopson. Brian volunteers in a number of capacities and is most active on the Train Committee. Mike is a relatively new volunteer, but has been very active and comes with a great background. We enter 2019 with a strong board, and well-prepared and thought-out goals which are published in this newsletter. If you aren’t already a volunteer, please check out the opportunities. They are numerous and varied. One of our goals for next year is to increase the number of volunteers. We have wonderful volunteers already on board, but sometimes they are pushed to their limit with everything that is going on. So much of what happens at the Arboretum simply wouldn’t happen without our volunteers. Even if you only have a few hours to spare, it would make a difference. This will be my last newsletter article as I am officially retired as Chair as of the end of the month. It’s been a wonderful, if sometimes stressful, job. If I had it to do over, I would do it again. It’s very easy to get excited about what’s happening at the Arboretum. We are so fortunate that a city of our size has such a wonderful facility. I am leaving my position in the hands of Sonya Wright who already has a year’s experience as Chair. She, along with the rest of the Board, will do a wonderful job to help keep the Arboretum as a favorite place for you to go. And I look forward to serving my last two years on the Board, continuing association with all of the wonderful people I find at the Arboretum. Vision: To support through funding, planning, and volunteering the Arboretum’s mission of advancing environmental education, recreation and the appreciation of nature in providing the community with both a cultural center and a nature preserve. By December 31, 2019 meet the fundraising goal of $350,000 to $375,000 through the Plant Sale, Brewfest, Luminary Walk and FOTA Memberships. Establish a committee to examine additional fundraising avenues with a recommendation by April 1, 2019. Establish a committee by February 1, 2019 to work in conjunction with ARFOP to develop a plan for funding and next steps for the Interpretive Trail. By February 1, 2019 the FOTA Marketing Committee will develop a marketing plan to support events, increase Arboretum attendance, increase awareness, and increase volunteer numbers. The Marketing Committee should include representation from Visit OP and the City. Establish a Volunteer Committee to determine gaps that need to be filled and develop a strategy to fill those gaps with a recommendation by May 1, 2019. Establish a working partnership with Friends of the Arts by March 1, 2019. In addition to being on the Friends of the Arboretum Advisory Board I have, for many years, also served on the Legacy of Greenery Committee, which is the Overland Park Voluntary Tree Board. 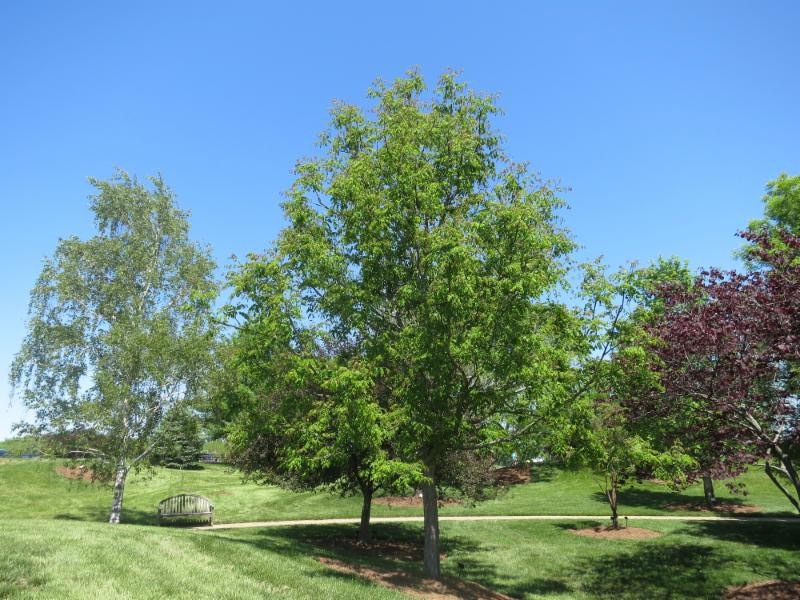 The City Council has demonstrated its commitment to the value of trees both through the purchase of land for and establishment of the Arboretum, which serves as an educational venue for trees, as well as creating the Voluntary Tree Board, which has helped Overland Park be a Tree City USA for 40 years. The Legacy of Greenery Committee was the originator of the idea for the city to purchase the land for the Arboretum and also is working to fully develop the Legacy Garden at the Arboretum. Check it out the next time you visit. Through both of these volunteer endeavors, I have come to know Robert Whitman. Robert lives in Overland Park and works for Gould Evans. He was on the Legacy of Greenery Committee when I joined, and since resigning, he has done several design and planning projects for the Arboretum. He is firmly committed to the value of trees, to preserving the existing trees and to planting new ones. Robert occasionally presents a program at a meeting of the Legacy of Greenery Committee. A couple of years ago he presented a program on canopy streets and the value they add to the livability on those streets. There are a number of canopy streets in the older sections of Overland Park. A few months ago he presented another program and gave us an article he wrote titled “What is a City?” It presents a different way of looking at what a city should provide to its residents and how streets and trees play into that. You can read the full article HERE. He also shared information with us regarding the value that street trees bring to neighborhoods. The Legacy of Greenery Committee has completed an inventory of all of the street trees in the city. By using this information as well as current sale prices of homes, Robert was able to compare three groups of three neighborhoods each. Neighborhoods with the most street trees had considerably higher per-square-foot sale prices than comparable neighborhoods with the least street trees. The variation in per square foot sale price was $157 versus $143, $148 versus $132, and $144 versus $129. This adds up to a lot of dollars in the total sales price. Trees make a difference! Learn about trees, protect trees, and plant trees – and there’s no better place to learn than our Arboretum. At the Overland Park Arboretum & Botanical Gardens, everything is ready for winter. All the lights from the Luminary Walk have been taken down, all is calm, and the gardens are all snug in their beds for a long winter’s nap. We’re almost at the end of 2018, and we’d like to take this opportunity to thank you for everything you’ve done this year! Whether you’ve served as a volunteer at one of our many events and activities or are a valued donor, your support is critical to the success of the Arboretum. While the Arboretum is owned by the city of Overland Park, your tax-deductible donations are necessary to move forward with daily operations and planned expansion. The next time you come for a visit, please take a look at our master plan posted in the Visitors Center and consider where you could help! The Arboretum is the jewel of Overland Park. As a supporter, you’re already aware of how it enriches the quality of life in our beautiful community. We’d love your help – whether it’s by bringing your friends and family out to enjoy all the Arboretum has to offer, by renewing your FOTA membership, or by making a tax-deductible donation – we can’t do it without you. You can learn more about the different ways to give on the Arboretum website. Thank you for everything you have already done, and we look forward to working together to make the Arboretum the best it can be!